Alice Cullen MP was elected for the Glasgow Gorbals constituency on the 30 September 1948, she continued to represent it until her death in 1969. Cullen joined the Independent Labour Party (ILP) in 1916 she was an active member becoming secretary of the local ward committee and a Glasgow town councillor in 1938. 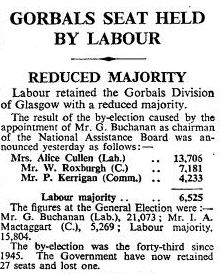 In 1948 George Buchanan MP for Gorbals resigned to become Chairman of the National Assistance Board. Cullen competed against three men to secure her nomination as the Labour candidate for the resulting by election. 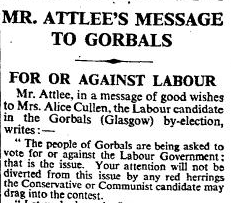 Prime Minster Clement Attlee sent a message of good wishes to Cullen and advised the people of the Gorbals not be distracted by ‘red herrings’ issued by the other two candidates, Mr Kerrigan (Communist) and Mr Roxburgh (Conservative). On winning the seat Alice Cullen becoming the first Catholic women to be elected to Parliament. She took the oath on the day of the new session on the 26 October 1948. Giving her maiden speech on 17 December http://hansard.millbanksystems.com/commons/1948/dec/17/housing-scotland#S5CV0459P0_19481217_HOC_39 she spoke about the ‘dilapidated, tumble-down, rat-infested’ state of housing in her constituency. Housing and the health and welfare of her constituents were to be her main concerns throughout her time in Parliament. Her campaigning on housing was rewarded with the Hutchesontown/Gorbals Comprehensive Development Area scheme which saw the demolition of the 62 acres of slums and their replacement with modern housing and flats in the early 1960s. Alice Cullen (bottom right) is shown in this important group photograph by Lord Snowden. 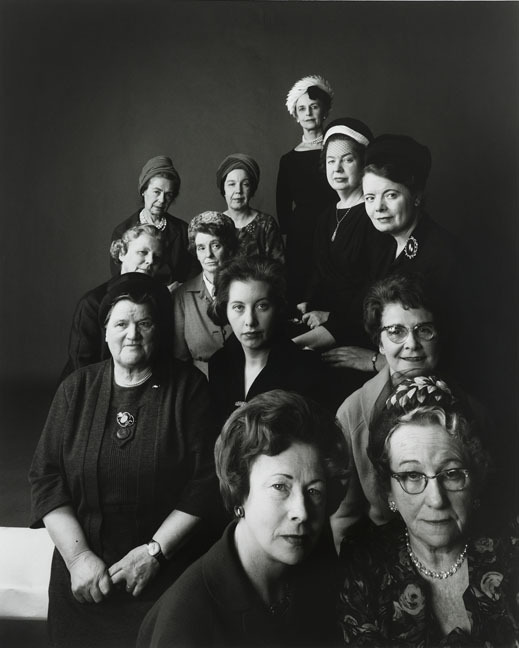 The other women MPs include Margaret McKay, Alice Bacon, Eirene White, Anne Kerr, Bessie Braddock, Judith Hart, Margaret Herbison and Barbara Castle.